When all the welding is done and before any machining is done I would ship those out to get a Cryogenic treatment done on them! I assumed pretty much every surface would have to be gone over and corrected but checking with a straight edge and feeler gauges nothing is moving around too much it seems. I was going to use threaded inserts everywhere in these heads - a few holes were stripped already when I got them (they are used, I didn't have the balls to do this on brand new castings!). 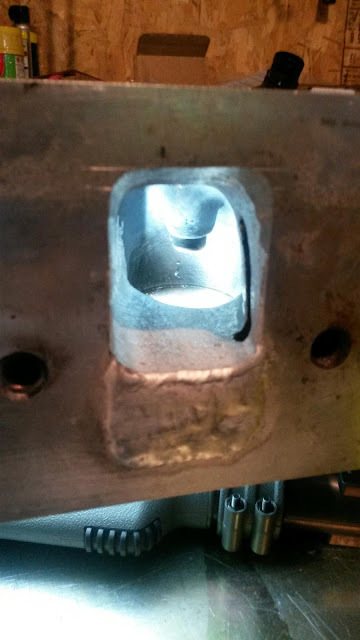 The one thing I think I will do is make rigid steel inserts for the bolt holes. I know that most guys don't bother with that on these castings but with this much welding I think it would be prudent. The way Marcella keeps making jokes about his super secret filler rod, I feel like it is probably 4043 or maybe 4943. Going back now I'd use the 4943 but the fact that a lot of guys do this using the low temp 5 series filler and don't have problems in services... makes me think that I don't have to worry too much about it. I think I will use 4943 for the spring pads but I just bought another 10# of 3/32" 4043 LOL. I hate to say this but you could do this with a set of Pro-Comp copies of this head with just the epoxy in the runners since they are already thick enough up top. 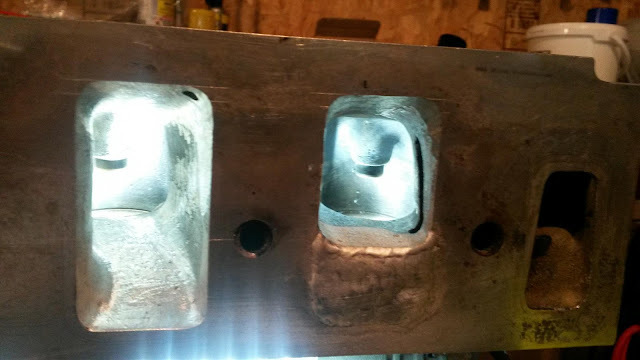 Edelbrock needs to step it up on their next casting box! So I've seen cryo treatment mentioned (notable Oldsmobile head porter Joe Mondello seemed to be a fan) but never heard an adequate explanation of how it helps. I figure this is the place? I am glad your dimensions are not moving much. I once did a double two barrel tbi intake top for a crossfire intake that I ported and the top shrank a huge amount. I just went over everything again and the deck surface is out about 0.004" end to end (curved up at the edges). Everything else won't even let a straightedge wobble. Getting this torch in there is doable now. Pulled the teflon insulator, cut down the ceramic cup with a diamond wheel on the lathe, and turned down the back cap to be nothing more than a brass button with an insulator on it (the last part isn't shown in this picture). The torch will now physically fit inside the runner and get good angle on the lower corners behind the pushrod pinches. The biggest issue is keeping good torch angle and also having a place to stick the filler rod *if* I can see the puddle. I may do the short turn apex by sticking the torch in the port and adding filler rod from the throat. Once you start getting into this stuff I realize how hard it is to do what Jody Collier does on Youtube (weldingtipsandtricks) with a camera always in the way. I'm thinking I might be able to adapt a short Pyrex gas lens setup to this torch, that may help to see things. I am pretty sure John Marcella uses a 9/24 size torch for this sort of thing based on the videos Miller has on their Youtube channel featuring The Man; I'm trying to get close without having to buy a third torch. Rick, ever thought about making a glove box to weld in so you can get rid of the gas lens or cup entirely? You could adapt a cheap small blast cabinet, or they make actual glove bags. The ones I've seen in chemistry labs were very thin, made to be disposable. Think a garbage bag with two gloves formed in one side. You put whatever inside, run a purge hose (and weld leads in your case) in the end, roll the end up and tape well, then purge. To keep it from pressurizing use an exhaust tube and run it into a water bubbler to keep air from back-diffusing in. You would have to basically put a box for support inside the bag. Yes, it will cost some gas to get it purged out but then the welding is much easier and faster. I don't know how you could handle preheat, either put it in hot and purge like crazy so you can weld before it cools, or maybe put an electric griddle in for the head to sit on so you could keep it sealed for a lot of welding? Anyway, just a suggestion. I did think about that. My background is in production chemistry, and specifically air sensitives, toxics, and acid chlorides, but other than converting a blast cabinet I wasn't sure how else I could handle the heat. Vacuum and pressure flushes and then a slight positive pressure with a bleed hole is how I'd do it in a cabinet, but then again, seeing into the runners is already a problem without a window in the way and a good distance to the workpiece. I was thinking about it again briefly the other day when I saw someone welding Titanium exhaust collectors in a converted blast cabinet. Funny story, we had one product we made (and this is several thousand kilos at a time) that required an iron powder addition to the reactor. We had to build a glove bag the size of a small car with a bunch of ports and several drums and a lifting dolly inside it. We weren't very happy with the PhD that came up with that. Rick Finsta wrote: I did think about that. My background is in production chemistry, and specifically air sensitives, toxics, and acid chlorides, but other than converting a blast cabinet I wasn't sure how else I could handle the heat. Vacuum and pressure flushes and then a slight positive pressure with a bleed hole is how I'd do it in a cabinet, but then again, seeing into the runners is already a problem without a window in the way and a good distance to the workpiece. I'm an analytical chemist, mass spectrometry instrumentation (FTMS in particular). Luckily I never had to deal with air sensitive stuff, but other people in our group did so I saw the disposable glove bags. Of course the inorganic guys had real inert atmosphere boxes, with gloves and airlocks. I've heard that Boeing in Seattle has rooms they purge for welding that you wear breathing gear in, I guess that would be a bit much for this . I was thinking you could make a frame or use a box to support the sides and top of a glove bag, and a spacer with insulation to protect the bottom (or my griddle idea). A blast cabinet would let you use the grate, use stainless and it might not conduct very much to the cabinet walls. I don't know if I'd use vacuum to start with, I'd be really worried about those large flat cabinet sides imploding. Just grit your teeth and turn up the purge. Anyway, just something to think about if you keep doing this. I run ICP-OES, GC-ECD, TXRF, and other associated environmental monitoring gear these days. Spent a long time running NMR, HPLC, etc. NERDS UNITE! I know the glove bags we used at Aldrich were a catalog item, and I'm pretty sure there was a metal frame support as well that was available commercially. I just couldn't sign my own Hot Work permit if I needed to weld inside combustible materials! Alright got some torch time today. I've got a #24 torch on the way - it'll get me another half inch shorter and still has a higher duty cycle than my TIG machine. I'm going to get them all roughed like this and then whenever * gets back to the port roughing I'll get some measurements to make sure I've got enough height for him before shipping. For reference the short turn is only about 0.100" taller there, but I needed to get in there and smooth everything out for a finish pass anyways. One more done. What a stupid idea this was! Hey *, should I give up? The port entrance roof is 0.625" Down from the top of the valve cover rail, and the port entrance floor is 1.43" up from the deck surface. So I raised the port entrances almost exactly one inch. Pipemax says 2.93" CSA would be ideal, I'm interested to see what * comes up with. Bigger over the SSR will slow the air down, and I think I want to be on the low side of 300-315fps? Again, interested to know what * thinks. Keep in mind I'm not porting these, just sticking filler in there so * has room to really explore the area. I'm interested to know what to do behind the pushrod sleeves that will go in there. Should I build up a ramp or leave it alone and the porting will account for the dead space behind the tubes? Thanks, Carnut1. Part of me is still considering moving the pushrods. I think I could offset turn a piloting setup for a drill that would locate on an existing hole and guide the drill. 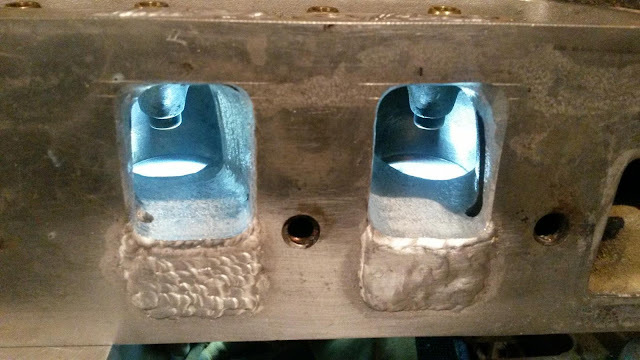 Without a mill it would be difficult to get it indexed to the valve cover rail. 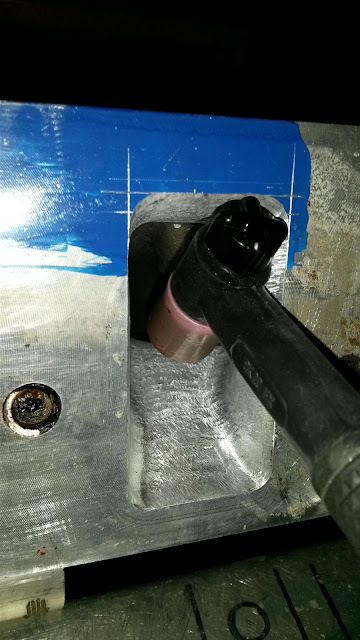 I could always make a jig that would index on two pushrod holes and then have the pilot for drilling only one at a time, or maybe make a jig that locates in the current holes and has pilots for all of them. I only need to move four pushrods per head, really.